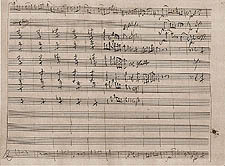 When completed, the full score of a concerto served as the source for a copyist to extract a set of parts, which Mozart used for his performances. 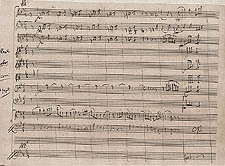 Mozart sometimes had AN EXTRA SET of parts made for his sister or one of his best students (for instance, Barbara Ployer or Josepha Auernhammer) or a paying patron. In the present case he also apparently had a business arrangement with the Viennese music-copying firms of Lorenz Lausch and Johann Traeg to sell sets of parts, which were advertised in the Wiener Zeitung. Constanze Mozart sold the autograph scores of the keyboard concertos to the Offenbach music publisher Johann André in 1799-1800, and gave Mozart's own sets of parts to their pianist-composer younger son, Franz Xaver (W. A. Mozart fils); the latter are unfortunately lost.